I decided to crochet a Noah's Ark set for my son's first birthday. (You can find the pattern I bought here.) Unfortunately, I didn't like the ark pattern included with it. I wanted to be able to take the set with us, to entertain him when we went out (and especially during church) and the boxy ark that they had made, meant to sit on the floor, just wouldn't quite cut it. Instead, I came up with this nifty bag shaped like the ark! 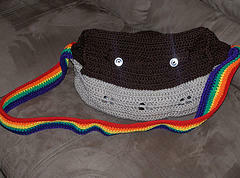 As you can see, I crocheted a rainbow for the strap, a touch which I think is very cheerful. I hope you enjoy making your own yarny ark!